My name is Gwen Rockwood — writer of newspaper columns, mama of three really funny kids and wife to Tom — who is also pretty funny but not when he leaves his butter knife and English muffin scraps on the kitchen counter. That just makes me crazy. But we’ll get to that later. My column, The Rockwood Files, started in 1995 a few months after I graduated from the University of Arkansas. In my last semester there, I took a course called Essay Writing. And I loved it so much that I didn’t even mind getting up to race across campus at 7 a.m. (an ungodly hour for a college student) so I could make it to class on time. But then I graduated and got a job as a bank teller — which makes perfect sense for someone with an English and Creative Writing degree, right? I knew I didn’t want to balance a cash drawer for the rest of my life but honestly didn’t know what to do next. I knew one thing, though. I knew I missed that Essay Writing class. One night around 11 p.m., I sat down at my computer in my one-bedroom apartment to write an essay just for fun. I wrote for what felt like 30 minutes and, when I looked up at the clock, it was two in the morning. That’s how you know what “your thing” is. When you like it so much that you can do it for hours and it feels like 30 minutes — like you just got started. The next day I polished up those late-night essays and sent them to the editor of the Stuttgart Daily Leader, which was the tiny newspaper in the town where I grew up. I asked if he’d consider adding me as a weekly long-distance columnist. And for reasons I still don’t understand, he said yes. In an effort to actually use the college degree my parents paid for, I left the bank teller job to work as the “assistant editor” at the Northwest Arkansas Times in Fayetteville, Arkansas. I thought I’d really hit the big time when I scored the job interview after responding to a classified ad. And then I realized it wasn’t really an “assistant editor” position as much as it was an “assistant TO the editor” job — as in bring the coffee, type up the obituaries, get a Coke for the reporter on deadline, answer the phones, and be nice to random people off the street who wander into the newsroom to gripe at the editor because their favorite comic strip got discontinued. I didn’t mind the job duties. On the day of the job interview, I told the editor I’d sweep the newsroom floor if it meant I’d have a chance to work around words. (Totally sappy thing to say, I know, but I meant it, too, which I think he liked.) He hired me the next day. After almost a year as the newsroom gopher, I asked the editor if he’d take a look at some of the columns I’d been writing, hoping like crazy he’d give me a column spot on top of my Coke-fetching and obit-typing responsibilities. He agreed, carefully editing each one and showing me how to do it better next time. So that’s how the column began. And soon after it did, I met Tom. We dated, broke up, dated again, broke up again, then finally figured things out and dated and got married. We moved around for his job a few times which meant I had to leave the newspaper. But I kept on writing columns and sending them in to my editor. Slowly, other editors read my work and added my column to their papers, too. Right now, the column appears in about a dozen newspapers in Arkansas, Oklahoma and Missouri. In 2001, I added “Mama” to my job title when our oldest son Adam was born. Two and a half years later, we had Jack. Two and a half years after that, we had Kate. They are my life, these kids. They make me laugh and they don’t even mind (yet) when I write down the stuff they do that might make a funny newspaper column or blog post. Here’s a photo of them. 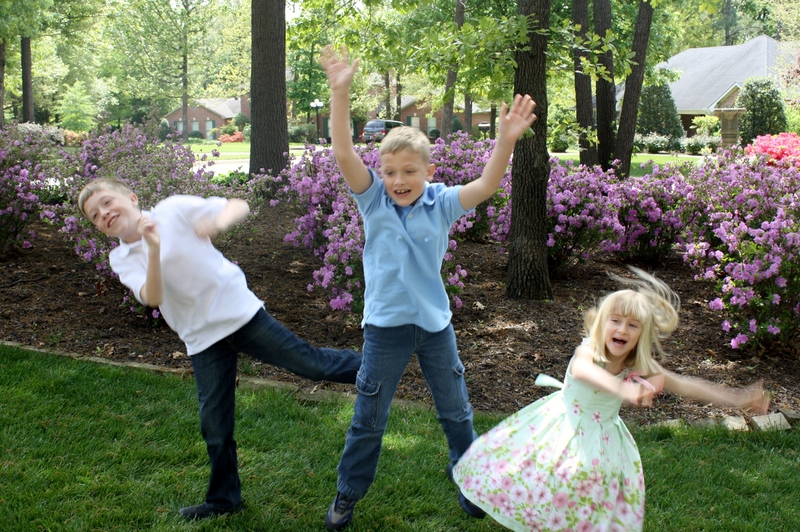 They’re jumping for joy because I’ve just released them from the mandatory Easter Morning group photo. In addition to the column, I also run a cool website for moms in my corner of Arkansas. The site is called nwaMotherlode.com, and I co-founded it in 2008 with my friend Shannon Magsam, who is also a former newspaper reporter turned mama. We’ve been running the website for four years now, and we have way more fun than we would doing anything else that English majors might actually get paid for. You can check it out by clicking here. If you’d like to talk to me about The Rockwood Files or about speaking engagements or fetching you a Coke when you’re super busy and can’t do it yourself, send an email by clicking here. And thank you for stopping by to read for a while. The Internet is a huge place and you could go anywhere. It’s a big deal to me that you came here. I Read your column and today the one about the dog and the topsoil bag sure hit home. We had a Chihuahua that barked at things that were different in our neighbors back yard. She would chase squirrels, rabbits, and birds though. We now have one that runs from the animals but barks at anything different. Keep up the good work. Thanks for the kind words, Sherry! I’m so glad you liked the column about barking at bags. Hope you’ll come back here often.